Iowa Gun Owners Calls Out Anti-Gun Senator Amanda Ragan! 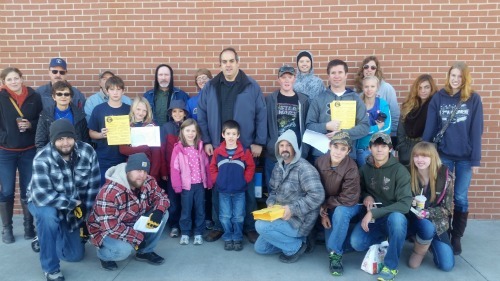 A huge crowd of 55 volunteers joined Iowa Gun Owners this past Saturday as we passed out copies of our 2014 Gun Rights Voter Guide to house after house in Senate District 27! Thousands of gun owners learned the truth about where the candidates stand on the 2nd Amendment after getting this vital information. In fact, so many volunteers turned out that IGO was able to blanket almost every town in the district, including: Clear Lake, Hampton, Latimer, Coulter, Sheffield, Rockwell, Bradford, Geneva, Dumont, Bristow, Allison, and Clarksville! All told, IGO volunteers passed out 5,000 flyers in 4 hours! All too often, voters, even gun owners, take what they hear from a candidate at face value. They assume that since they tell the truth, that candidates running for office do too. Sadly, that’s just not true, especially as it pertains to the 2nd Amendment. Instead, anti-gunners do all they can to make sure that “what happens in Des Moines, stays in Des Moines.” And when it comes to your gun rights, that’s more true than ever. Gun-grabbers know that if their radical ideas are made known to the voters in their districts, their political careers suffer. Certainly seeing waves of anti-gunners get swept out of office right here in Iowa in 2010, with more in 2012, not to mention high profile races like the ones in Colorado where anti-gunners were recalled out of office, has sent a chill down the spine of Iowa’s anti-gun legislators. That’s why they do all they can to mask, distract, and in some case, flat out lie about what they’ve done in Des Moines. Senator Amanda Ragan certainly isn’t trumpeting the fact that on March 27, 2010, she cast a decisive vote against Constitutional Carry legislation – even though it had bi-partisan support – in a move designed to ensure that the bill died on the Senate floor. Nor is Amanda Ragan telling gun owners about the fact that she refused to sign a “discharge petition” in 2012 on our Stand-Your-Ground bill. This bill, which would eliminate the need to retreat in the face of danger, and provides important civil protections to those involved in a self-defense shooting, was ineligible for further consideration because it was two votes short on the “discharge petitions.” Two votes! In fact, when we visited Senator Ragan’s website and looked under “Priorities” all it says is, “Sorry, no content matched your criteria.” You can’t make this stuff up! Now, facing re-election, Senator Ragan isn’t surveying either – which often is an indication that a candidate intends to support a radical agenda in Des Moines. That’s why close to 5 dozen volunteers fanned out Saturday across this district – to make sure the voters know about Senator Ragan’s repeated votes and actions against the 2nd Amendment! We are determined the make sure that gun owners know the truth about her record. At the same time, Shawn Dietz, running against Ragan in this race, has scored a perfect 100% on his Iowa Gun Owners’ 2014 Candidate Survey. Dietz was very clear to us in his complete and utter opposition to all forms of gun control here in Iowa, and he was willing to put his positions in writing, so that all could hold him accountable and see where he stands. In addition, Shawn Dietz supports Constitutional Carry, Stand-Your-Ground, Pre-Emption reform and more. In fact, Dietz said he’s willing to sponsor these pieces of legislation! These are the facts that IGO volunteers put into the hands of the voters of Senate District 27 last Saturday. So we want to thank all of the volunteers that came out to help. As we’re doing every weekend, we pulled one name out of a hat and last Saturday FIRST LAST won a FREE Ruger 10/22 rifle from IGO for helping us out! What’s more – we’re giving one away next Saturday too as we’ll be focusing our efforts in Sioux City. Can you help us? We’ll be meeting in Sioux City at Hardees, located at 910 Gordon Dr., (right off the interstate) at 8:45am. By 9am we’ll have separated into teams, distributed maps, and have you on your way. At 1pm we’ll be meeting back up at Famous Dave’s BBQ located at 201 Pierce St., Sioux City, IA. Don’t forget, one volunteer will be winning another Ruger 10/22 if they can help us for just four hours! If you can’t make it this Saturday but can chip in financially, please do so so that we can keep these vital programs running. Your gift, whether that be $100, $10, or anywhere in between, will be put right to the fight in Iowa! P.S. Pro-gun volunteers in Northern IA gathered last weekend in Senate District 27 and spent the morning going house-to-house passing out flyers exposing the anti-gun record of Senator Amanda Ragan. Ragan, one of the radical anti-gun legislators in Des Moines, paints an entirely different picture of her views on your gun rights when she’s in the district. The volunteers you see below are some of the members of Iowa Gun Owners who spent 4 hours last Saturday making sure everyone in Senate District 27 knows the truth! A huge thanks to everyone who turned out to help! We are going to be busily educating voters in Sioux City this coming Saturday, and we could use your help! Information is above. We really need your help from 9am-1pm. The best part is, we’re giving away a Ruger 10/22 rifle to one volunteer who can come out for those four hours. So please email us ([email protected]), call us (515-309-7858), or Facebook us if you can get involved! Finally, if you can’t make it this weekend, please consider helping us cover the cost of these crucial programs with your gift of $50, $25 or even just $10 today!